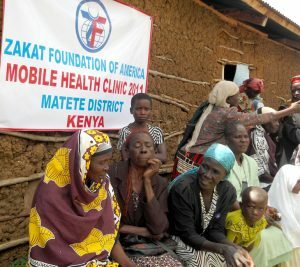 Bungoma: While most of the country’s health services were nearly paralysed by last month’s doctors’ strike Zakat Foundation of America opened up free mobile health clinics in rural areas of Matete, Matungu and Mt. Elgon to mitigate the effects of the strike. The mobile clinics served mainly the poor from the community both Muslims and non-Muslims attending to children and women. Government and community leaders hailed the Foundation for responding quickly to the crisis. SUPKEM chairman Western Province Sheikh Abdiswaleh Wafula, lauded the Foundation for intervening to provide free medical services to the community at the time of dire need.